These are on Tuesday nights, and I bet if you planned it right, you could see a free outdoor movie in Manhattan or Brooklyn every night of the week. Although these don’t have the view that the Brooklyn Bridge Park series has, it’s still a great selection of movies. The immortal words quoted above were uttered by all of our favorite pirate, Captain Jack Sparrow, in all of our favorite pirate movie, Pirates of the Caribbean: The Curse of the Black Pearl, a.k.a. Pirates 1. 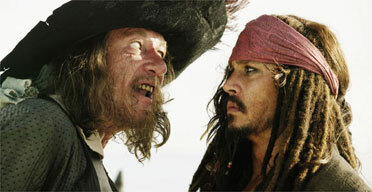 In this scene, Captain Jack is trying to explain to Will Turner, nascent pirate, the essential truth of piratehood: you can only trust a pirate to do what’s in his own best interest in the moment without regard to promises, alliances, or interpersonal relationships. Like me, some of you may have watched Pirates 3 this weekend. Also like me, some others may have read a few reviews about the film. Many of the reviews I read (I only read one) pointed to a real shitshow of conflicting plot lines which made the movie virtually impenetrable for the mind of a grown person. I totally agree with this claim, but I still think this was the best of the three Pirates movies. I think the real problem is the general public’s inability to deal with the intricacies of pirate culture. At World’s End featured more alliance-switching than a bunch of gypsies playing Risk. There were three or four general sides – two competing pirate factions, the Navy and then an occasional personal grouping (like lovers, or people trying to lift curses, etc.). So that’s already kind of confusing. As the story progresses, the pirate factions join and separate, individuals make pacts with the Navy or another pirates, and then all of those promises are repeatedly broken, repaired and then rended again. It’s zany! But this is not a symptom of poor story telling. It is simply art imitating pirate life. As I mentioned earlier, a pirate can only ensure acting in his own best interest. There’s nothing you can do about it. It’s just how pirates are. And clearly the pirate scholars who wrote this movie, or at least provided consulting services, were trying to express this cultural phenomenon. And if it confused you, well, I guess that just makes you a bad pirate. Pirates trying to out-pirate each other.